As said earlier, the major types of Prabandha were counted as four: Shuddha Suda, Salaga Suda, Alikrama and Viprakirna. But, the term Suda has been in active use since 11-12th century in the works of Somesvara (Ca, 1130), Haripaladeva (Ca.1175), Prasvadeva (Ca.1200) and other writers who preceded Sarangadeva (13th century). And, Sarangadeva was the first to present the class of Suda systematically, lending it a theoretical base. (However, he did not seem to have defined the term Suda). For about 300 years thereafter, the terms and descriptions provided by Sarangadeva were adopted by all the later authors. Suda iti Gita-vishesha-samuha-vachi Desi sabdah. Suda ityesha desiya-shabdo gitaka vachakah. There is another explanation where Sudu is said to be a Kannada term meaning ‘ a small bundle of grass’ ; and it signifies knotting together ( ekatra-gumpham ) of different Taalas . 2.2. Mahamhopadyaya Dr. R .Satyanarayana surmises that since both Kallinatha and Vekatamakhin hailed from Kannada country, Suda may have been an Old -Kannada term derived from the root Sul (meaning sound in old Kannada). And, Suda denoted a group of certain type of songs. 3.1. Prabandha in the early texts has been explained or identified with reference to its general physical features. “chaturbhir- dhatubhih shadbhishcha-angairyah syat prarbandhate tasmat prabandhah”. 3.2. Somesvara (Ca. 1126–1138 CE) in his Manasollasa confirms and expands further. And, Sarangadeva (Ca.1230) in the fourth Canto of Sangita-ratnakara sums up the formal features of Prabandha as: Six Angas (Svara, Birudu, Pada, Tena, Paata, and Taala) which like the limbs of a body are the integral parts of a configuration called Prabandha; and four Dhatus (Udgraha, Melapaka, Dhruva and Abhoga) which are like substances or elements that regulate the proper working of the body. 3.3. Among the Angas: Svara signifies the notes (sol-fa passages); Birudu stands for words of praise, extolling the subject of the song and also including the name of the singer or the patron; Pada the meaningful words; Tena or Tenaka are vocal syllables , meaningless and musical in sound with many repetitions of the syllables like Te and Tna conveying a sense of auspiciousness (mangala-artha-prakashaka); Pata vocalized drum syllables or beats of the percussion and other musical instruments; and, Taala is musical meter or the cyclic time units. Of the six Angas, it was said : Tena and Pada, reflecting auspiciousness and meaning respectively are its two eyes; Pata and Birudu are the two hands because they are produced by the hands, the cause being figuratively taken for effect; Taala and Svara are the be two feet as they cause the movement of the Prabandha. As regards the Dhatus – Udgraha, Melapaka, Dhruva and Abhoga – were said to be like the Dhatus ( energies or Doshas) of Vata (wind), Pittha (bile) and Kapha (phlegm) that support (Dharana) and sustain (Bharana) body functions and the physical constitution; and, Prakriti which is the basic nature of body. Thus Prabandha, like a well functioning human body, with its textual, melodic and rhythmic components was conceived as a well structured musical composition. the Taravali Jaati has only two Angas ( in which pada and Taala are present) . No Prabandha could be conceived with only one Anga. Similarly, Prabandha was also classified according to the number of Dhatu-s : Dvi-dhatu (Udgraha and Dhruva); Tri-dhatu (Udgraha, Dhruva and Abogha); and Chatur-dhatu (Udgraha , Melapaka, Dhruva and Abogha). 6.1. The term Dhatu has many meanings such as substance (dravya), thing (Vastu) , element , layer, constituent part, ingredient, element etc. In the present context, Dhatu could be taken to mean an element or a section or sections of a Prabandha composition. : – Udgraha is the commencing section of the song. Here the song is first grasped (udgrahyate), hence the name Udgraha. Udgraha is said to consist a pair of rhymed lines, followed by an ornamental passage; and, then by a passage of text describing the subject of the song. Thus there should be pair of lines in the Udgraha and also in the third section. : – Melapaka is the bridge, the uniting link between the two Udgraha and Dhruva. The Melapaka should be rendered adorned with ornamentation (Alamkara). : – and, Abhoga is the conclusion of the song. Abhoga gets its name because it completes (Abhoga) the Dhruva. It should mention the name of the singer. Once the Abhoga has been sung, Dhruva should be repeated. 6.3. Among the four Dhatus, the two – Udgraha and Dhruva – are essential and indispensable. And the other two, Melapaka and Abhoga may or may not be included. 6.5. In addition, there is an optional fifth Dhatu called Antara (or Antara-marga, the intermediate note) which connects Dhruva and Abhoga. (Antara was used exclusively in Salaga Suda). 7.1. The scholars surmise that a typical Prabandha might have been rendered in the following sequence. The opening Udgraha will begin with a couplet set to mater (Chhandas), in meaningful words (Pada) setting out the main theme of the song and continuing with elaboration of the melodic syllables (Svaras). Then, in the interlude which functions as the bridge (Melapaka), one may or may not have passages of Tena. Then comes the main section Dhruva set in meaningful words (pada) and meter (Chhandas) with appropriate Taala cycles. Here, the rhythmic element of the song gets more intense. Then, one could have an optional section (Antara) perhaps with rapidly recited Pata syllables – before coming to the concluding section. For the concluding section (Abogha), the Anga Birudu is required as the signature (Mudra) of the composer or singer or as a dedication to the patron. The performance could conclude with repletion (refrain) of main lines from Dhruva. 8.1. As mentioned, the ancient Prabandhas were arranged in four classes: (1) Shuddha Suda – the pure or the classic type; (2) Alikrama, the intermediate type to be inserted in Shuddha Suda ; ( 3) Salaga Suda the pseudo-classical songs of mixed nature intended for art-music, theatre and dance; (4) Viprakirna, separate or different type of songs. 8.2. Of these, the songs of the Shuddha Suda, governed by strict rules, were regarded as the classical musical suit of the middle ages. They had to conform to the prescribed Raga, Chhandas and Taala in addition to the other criteria as specified- (Ragadi –anyatyad asya shuddhatvam ishyate). 8.3. The Shuddha Suda was divided into eight types: Ela, Karana, Dhenki, Vartani, Jhombada, lambaka, Rasaka and Ekatali. While rendering, it had to consist between four and eight songs from among these eight types. They were sung in Jaatis and Grama Ragas and their derived archaic Ragas. 9.1. It appears the Shuddha Suda songs were mainly prayers and songs that eulogise various virtues. For instance; in the Ela the first song of the Shuddha Suda , which have Chhandas, Alamkara and Rasa etc , praise the virtues of detachment (hana or vairagya), generosity (audarya), benevolence (saubhagya), heroism (shaurya) and courage (dhairya). The Ela songs were said to be blissful to the performer and to the person who figured as the main character in the song. It was said that by singing the Ela with devotion (bhakthi) and sincerity (shraddha) one would be blessed with the grace of the goddess Sarasvathi .And Varahi would increase the passion, Durga the ferocity and Indrani the regal valour. It appears that Ela was not sung separately but as a part of suit of cycles (Suda) . It is said; Ela in praise of Goddesses Sarasvathi and others were sung in Raga Takka, Sriraga, Vasantha, Hindola, Malavakaisika and Kakubha. But, sadly no example of a suit having at least four songs ahs come down to us. The Rasaka songs under Shuddha Suda were similar in structure to Jhombada song. They also had the first section (Udgraha), bridge phase (Melapaka), refrain (Dhruva), conclusion (Abogha) , and again refrain– punar-punar-upadana – (Dhruva) or Udgraha; and in addition it would also have an improvised introduction Aalap. Srimad Bhagavatha (Canto 5, Chapter 31) provides rare examples of the Rasaka songs (of both the Shuddha Suda and Salaga Suda cycles) . They celebrate the celestial dance and songs of Krishna and the Gopis. 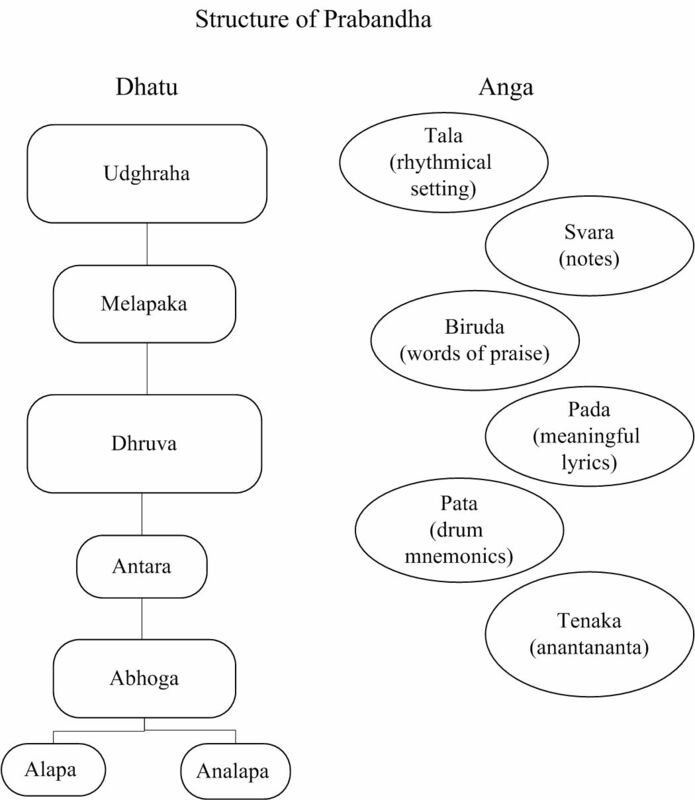 Karana songs had three Dhatu-s: Udgraha, Dhruva and Abogha (But not the Melapaka) . Dhruva was made of Pata (vocalized sounds or beats of the percussion) ; and auspicious (mangala) sounding words or sounds like tenna-tena-tom . Karana was said to be of nine kinds. Dhenki songs were set to combination of different Taala-s. In contrast, the stanzas Vartani songs were different Ragas. The Ekatali songs of the Shuddha Suda consisted of Udgraha , Dhruva ,Abogha and Dhruva again. The first section of the Udgraha could have the structure of an Aalapa. 10.1. Salaga is the Apabhramsa (or the localized name) for Chayalaga (suggesting that it is a shadow of the Shuddha variety). Salaga Suda was Niyukta Prabandha and belonged to Taravali Jaati because it had only two Angas– Pada and Taala. It also had only three Dhatus: Udgraha, Dhruva and Abhoga (but not Melapaka). Hence, the Salaga Suda came to be known as Tri-dhatuka Prabandha; and, was considered pseudo-classical. And, the Salaga was set to Desi Ragas (Desi-ragadi-samabandat Salagatvam api smrtam). Yet, the Salaga Suda ranks high among the ancient type of refined songs. Venkatamakhin, in his work, takes up only the Salaga Suda for the discussion on the Prabandha-s.
10.2. The seven types of Salaga Suda songs that Sarangadeva mentions in his Sangita –ratnakara are: Dhruva, Mantha, Prati-mantha, Nihsaru, Addatala, Rasaka and Ekatali. A similar classification is mentioned in Sangita-siromani and in Kumbha’s Sangita-raja. Here, excepting Dhruva, all the other song-types are named after their Taala. The Rasaka and Ekatali songs of the traditional Shuddha Suda re-appear in the Salaga Suda. Their Taala is still the same. but the musical setting of the main section has changed. In the Rasaka of Salaga Suda, the Udgraha (initial) section itself could be rendered as Aalapa or the Aalapa phrases could be used at the beginning , in the middle or at the end of the Dhruva section. In the Ekatali of the Salaga Suda, the Antara , which in the other songs of this class functioned as an optional section following the Dhruva, became obligatory and was sometimes performed with Aalapa phrases. [ It is interesting to see how the Taala of the medieval mixed suit Salaga Suda found their way into the South Indian Music. In his treatise Sangita-sudhakara (Ca.1179) the Gurjara King Haripala describes seventy-six Prabandha songs. Among these songs one may recognize some compositions of the Salaga Suda class: Dhruva, Mantha, Jhampa, Addatala and Ekatala, but also other songs such as Rupaka and Tivida (= Triputa). The names of the seven songs called after their Taala correspond to the names of the seven Taalas of the modern Karnataka system. 11.1. Of these seven varieties of the Salaga Suda compositions, the Dhruva type was the prominent one. And, the Dhruva was different from the others in its construction. The others also had similar structures but they lacked the invisible-auspicious benefits (adrustaphala). 11.2. Dhruva, in the context of Natyashastra, initially meant stage-songs, which formed an important ingredient of the play. Natyashastra mentions different types of Dhruva-s and their uses in different dramatic sequences. It is said; these were called Dhruva-s because their words, Varnas, Alamkaras and Jaatis were are all regularly (Dhruvam) connected with one another. . Dhruva is also explained as Nityatva and Nischalatva having a character of stability. Natyashastra describes five kinds of Dhruva-s : Praveshika, Nishkamanika, Prasidita , Akshepita , and Antara. They were, of course, employed depending upon the context in dramatic situations. But, in Prabandha, the Dhruva Prabandha refers to a rigid and tightly knit structure consisting three sections or Dhatus (Udgraha, Dhruva and Abogha) and an additional section Antara, if needed. Sangitaratnakara lists sixteen types of Dhruva Prabandhas: 1.Jayanta; 2.Shekhara; 3.Utsaha; 4.Madhura; 5.Nirmala; 6.Kuntala; 8.Chara; 9.Nandana; 10.Chandrashekhara; 11.Kamoda; 12.Vijaya; 13.Kandarpa; 14.Jayamangala; 15.Tilaka; and, 16.Lalita. The objectives of these songs were ,generally, the attainment of auspicious (mangala–prada) things in life, such as : longevity, worthy progeny, progress in life, growth in luster, enhancement of intellect, enjoyment, victory, and securing ones desires etc. Kallinatha in his commentary suggests a correction to the general rule. He tries to view the virtue of a composition in terms of its ‘meaning-content’- Akshara-artha and Pada-artha. He remarks that a composition which is ‘irregular’ (aniyama) in regard to the number of its syllables (akshara-sankhya) could still be considered as Dhruva Prabandha, if the Pada aspect is according to the rules. And, even otherwise, when the composition is irregular in regard to the number of words in the text (Pada-sankhya) , it can also be considered as Dhruva Prabandha if it is endowed with other virtues (guna) such as Rasa, Taala ,etc. That perhaps was to suggest that the evaluation or classification of a composition did not entirely depend on the presence/absence of certain structural components. 11.3. Dr. R. Satyanarayana explains that while rendering a Dhruva Prabandha a particular order was followed: First Udgraha containing only one section (only one Dhatu), then a pause. Thereafter, the melodic element Dhruva is sung twice (refrain). If there is no Antara, Dhruva is followed by the Abhoga, sung once. This is followed by the Dhruva on which the song rests. If there is an Antara, it is sung in any order at the pleasure of the singer; but, it should be followed by Dhruva, Abogha and Dhruva each rendered once in the same order. [In the Ekatali song of the Salaga Suda, the Antara (which in other cases was an optional section) became obligatory and was sometimes performed with Aalapa phrase. 12..1. Dr. R. Satyanarayana explains that till about the 12th century, a Salaga Prabandha was often named after its Taala, since the Taala provided the rhythmic description of the song. In this manner, he says, we have Varnas which signify the names of a Nrtta, Vrtta, Taala and Prabandha. Dhruva Prabandha, he explains, was unique in the use of Taala-s in that it employed nine separate Taalas, while they were sung as a series of separate songs. Thereafter, there came into vogue a practice of treating each song as a stanza (or charana as it is now called) of one lengthy song. And, it was sung as one Prabandha called Suladi. Thus, the Suladi was a Taala-malika, the garland of Taalas or a multi-taala structure. There was also a practice of singing each stanza of a (Suladi) Prabandha in a different Raga. Thus, a Prabandha was a Taala-malika as also a Raga-malika. 12.2. Matanga mentions about Chaturanga Prabandha sung in four charanas (stanzas) each set to a different Raga, Taala and language (basha). Similarly, Sharabha-lila had eight stanzas each sung in a separate Raga and Taala. 12.3. Sarangadeva mentions several types of Prabandhas which were at once Raga- malikas and Taala-malikas: Sriranga, Srivilasa, Pancha-bhangi, Panchanana, Umatilaka, and Raga-kadamba. 12.4. The Raga malika, Taala malika and Raga-Taala- malika concept was adopted and improved upon by the Haridasa (Sripadaraya, Vyasaraya, Vadiraja, Purandaradasa and others) to produce series of Suladi songs. 13.1. It is said; the term Ali denotes a line or a row; Krama indicates the ordered sequence. It appears, the Ali when rendered along with or inserted into the Shudda was called Alikrama. The Alikrama Prabandha is, thus, a series of systematically arranged Prabandhas, perhaps ordered according to syllables (Varna) or Matraka (Akshara). It was believed such singing was equivalent to chanting the Mantras. The origin of such practice must have served a ritual as well as an artistic purpose. Manasollasa provides instances of the arranged Ali Prabandhas. 13.2. The Ali Prabandhas were twenty-four in number (Varna, Varnasvara, Gadya, Kaivada, Angacharini, Danda, Turangalila, Gajalila, Dvipadi etc. and when the Ali Prabandhas were combined with Suda they were said to be thirty-two. Several Ali Prabandhas were fused together to form a single Prabandha (in contrast to Viprakirna which were scattered and rendered individually). 13.4. Many songs of the Ali Krama were named after their Chhandas. In the Ali Krama songs some well known types of Chhandas from classical Sanskrit poetry, such as Arya, Totaka and Dvipatha as well as their Prakrit equivalents (Gatha, Dodhaka etc) were employed. 14.1. Some instances of Ali Prabandha are mentioned. : – Krauncha-pada was a type that opened with Svaras (sol-fa syllables) in its Udgraha section followed by words in the Dhruva section. The Abhoga section carried words conveying the Prabandha name and the two signatures (Mudra). 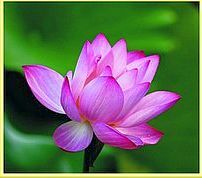 : – The Svara-artha Prabandha of Alikrama had the seven Svaras arranged in such a manner that it would form a meaningful sentence in which the Prakrita words were also, often, used. :- The Dhvani-kuttanl was a type of Ali Prabandha, in which two different Taalas were used in its two sections (Dhatu) , as a result the Laya also varied in its tempo. The sections were separated by a brief pause. : – The Pancha-Tala -Svara Prabandha s of Alikrama class used to commence with an Aalapa. Five Padas out of all the Padas were repeated twice. The instruments such as Mujara-vadya ( a type of percussion) were used along with Pata (vocalized drum beats) . After each Khanda (section) of singing a different instrument was used. : – The Raga-kadamba Prabandha of the Alikrama class employed different types of Taalas with different Chhandas ( meter) while presenting a series (garland ) of Ragas. 15.1. Viprakirna conveys the sense of being scattered, disbursed, dishevelled or extended. The Viprakirna or the mixed class of Prabandhas were separate pieces of songs set in simple Chhandas and in simple words. Many Viprakirna songs were in the regional languages. In the Viprakirna Manthaka songs, particular variety of Mantha Taala was used in combination with other musical metres or other varieties of the same Taala in each of the sections. The names of the songs indicate their subject: Lakshni-kirti, Hara-smaraka, Gauri-priya, Madana-vallabha .etc. There were also other popular types of songs praying: for fortune (Sriprada, Srikara, and Sampathkara); for begetting sons (Putra-prada), for begetting daughters (Tanaya-prada), for mental peace (Mati-vilasa), for good for destruction of enemies (Shatru-mardana). Several of the of the above mentioned auspicious Manthaka songs were performed in special Ragas. For instance ; Lakshmi-kirti in Raga Mallara; Hara-smaraka and Gauri-priya in Raga Kedara; Putra-prada in Panchama; Satpitaputra in Gurjari; Srikara in Sri Raga ; Tanaya-prada in Vasantha or Lalitha ; Rati-lila in Saurastra Raga and Shatru-mardana in Varali raga. In due course, the Viprakirna replaced ancient complex songs of Shuddha Suda and Alikrama suits. 15.2. It is said; the North Indian poetical pieces such as Doha (Dohada) couplets and Caupai (Chatus-padi) the four lined songs were derived from the Viprakirna Prabandha. Similarly, in the South the devotional poetry of Kannada adopted meters of Tripadi and Shatpadi. In a like manner, each linguistic region of India developed its own types and forms of poetry, especially in devotional music. 16.1. The Viprakirna Prabandhas were said to be of thirty-six types, such as shrirariga, tripadi, chatushpadi, shatpadi, vastu, vijaya, Tripatha, Rahadi, Virasri, Srivilasa etc. Some instances of the Viprakirna Prabandha are mentioned. : – Rahadi songs of the Viprakirna class were composed describing battle sequences in Vira Rasa. :-In the Virasri of Viprakirna one stanza was composed in the spoken language (Basha pada) and the next was made of Birudu , the epithets or expressions of admiration. : – Srivilasa songs of the Viprakirna employed five Ragas and five Taalas; while the Saranga songs were set in four Ragas and four Taalas. :- Tripatliaka had three Dhatus (sections) composed of syllables of Vadya (Pata), words of praise (Birudu) and Svaras, in a serial order (karma). : – Chaturanga was composed of four Dhatus (sections) each section was in different language, different Chhandas, different Raga, different Taala . :- Caccari songs were sung during the spring festival (Vasanthotsava) composed rhyming couplets in regional languages (Prakrit), set to Hindola Raga and Caccari –Taala or Krida-Taala. The rhythm was of importance in these songs that were sung with group dances. 17.1. While on the subject of Prabandha, I cannot resist talking about the most enchanting Gita-Govinda of Sri Jayadeva Goswami (about 1150 A.D) who was a court poet of the King Lakshmana of the Bengal region ( 12th century ) . It is the most celebrated and the best loved among the Prabandha class. It is a semi-dramatic composition of twelve episodes (Adhyayas ) consisting monologues in sixty slokas and twenty-four songs of eight lines (Astapadi). 17.2. Though it is recognized today as the sublime Shringara-mahakavya that lovingly describes the emotive sports of Sri Radha the Mahabhava highly idealized personification Love and Beauty; and Krishna the eternal lover (Sri Radha-Krishna lila) , it is basically a Prabandha composed of Anga, Dhatu, Sahitya, Raga, Taala, Murchana, Rasa and Bhava. Sri Jayadeva at the commencement of his Khandakavya states that he is composing a Prabandha Kavya (Etam karoti Jayadeva kavih prabandham). The Ashtapadi (eight footed) is a Dvi-dhatu Prabandha, i.e. consisting two sections (Dhatu): Udgraha and Dhruva. The Gita Govinda abounds in a large number of song-sequences; and, each is titled as Prabandha viz. Prabandha-I, Prabandha-II etc. Yet; it is nearer to the Prabandha songs than to a Kavya (classic poetry). Gita Govinda is the most enchanting collection of twelve chapters (Sarga). And, each Sarga commences with soulful a Sloka followed by one or two songs arranged in couplets. These songs are known as Giti, Prabhanda or Ashtapadi, since twenty-four of such (but not all) employ eight couplets. Sri Jayadeva himself calls them as sweet and delicate Padavali-s (Madhura komala padavalim). 17.3. Gita Govinda in simple, delightfully lucid Sanskrit is one of the finest Khandakavya-s that is classified as a Prabandha. At the same time, it is permeated with intensely devotional and delicate Madhura Bhakthi. The Gita Govinda was one of the inspirations of Sri Chaitanya Mahaprbhu who was steeped in Krishna-bhakthi; and, it is the primary text of the Gaudiya Vaishnava School of Bengal. The Gita Govinda one of the principle texts of the Bhakthi movement has also been a unique phenomenon in Indian music. This evergreen lyric sequence is set to music and rhythm by the poet himself. And, musically, each of the twenty-four songs or Prabandhas in Gita Govinda is set to a Desi Raga and a Taala. His Ragas were : Malava, Gurjari, Vasantha, Ramakari, Malavagowda, Karnata, Desakya, Desivaradi, Gowdakari, Bhairavi and Vibhasa. And his Taalas were: Yathi, Rupaka, Eka, Nissara and Ashta. Sadly, we, now, do not know how the Raga mentioned therein actually sounded or what their scales were. Therefore, their correct interpretation and rendering are lost to us. The Astapadis in the modern days are rendered in Karnataka and Hindustani Ragas currently in use . There are many legends associated with Gita Govinda. For instance; in the nineteenth Ashtapadi, Krishna requests Sri Radha: The poison of love has gone to my head, Place your tender rose-colored feet on it to let the poison recede (Smara garala khandanam, Mama sirasi mandanam, Dehi pada pallava mudaaram). After he wrote these lines, Sri Jayadeva wondered whether it was appropriate for Sri Radha to place her foot on the head of the Lord. Then, he promptly scored out those lines. And, next morning to his wonder and amazement those very lines appeared again in his script. Sri Jayadeva took that as the Lord’s blessing and approval of his Prabandha. 17.4. The immense popularity of Gita Govinda is phenomenal . Each region and each language of India embraced with love and devotion; adopted it as its own; sang in its own chosen Raga; and, interpreted it in its own dance form. Several poets , inspired by the Gita Govinda, have created lyrical poems in Sanskrit and in the regional languages, elaborating on parallel themes. The most noted of such delicately beautiful poems (Madhura komala padavalim) are; Sri Krishna Lila Tarangini of Narayana Thirtha (Ca.16th century); Mahakavi Vidyapati Thakur’s (15th century) love-poems in Sanskrit and in Maithili; and, hundreds of Padavali-s in regional dialects by Vaishnava saint-poets. 18.1. The Prabandha served as an extremely versatile, resourceful and ever changing musical format allowing scope for many of regional variations. Prabandha as a class of Music had a very long and useful life spread over centuries. It was the dominant form of Music, Dance and other poetical works for more than a thousand years ending by 1700 AD or a little later. The term Prabandha almost went out of use after the 17th century. And, in its later stages, Prabandha came to be understood as the final component of a four-fold system (Chatur-dandi) devised by Venkatamakhin: Raga; Thaya; Gita; and Prabandha. 18.2. Although, Prabandha, as a genre, has disappeared, its influence has been long-lasting, pervading most parts, elements and idioms of Indian Music – both of the North and of the South. The structures, internal divisions, the elements of Meter (Chhandas), Raga, Taala and Rasa , as also the musical terms that are prevalent in the Music of today are all derived from Prabandha and its traditions. Many well-known musical forms have emerged from Prabandha. Thus, Prabandha is, truly, the ancestor of the entire gamut of varieties of patterns of sacred-songs, art-songs, Dance-songs and other musical forms created since 17-18th century till this day. 18.3. For instance; the Dhrupad (Dhruva-pada) of the Hindustani Sangita Paddathi, which insists on maintaining purity of the Ragas and the Svaras, evolved from Salaga Suda Prabandha, which had five Dhatus namely Udgraha, Melapaka, Dhruva, Antara (optional) and Abhoga. Of these, the Abhoga, being very long was split into two sub parts the Sanchari and the Abhoga. The Dhruva was also dropped. The Dhatus of the Dhruva-pada-prabandha thus became Udgraha, Melapaka, Antara, Sanchari and Abhoga. Later Udgraha and Melapaka were combined into one division called the Sthayi. Thus the modern Dhrupad , rooted in Prabandha, has four divisions: Sthayi, Antara, and Sanchari Abhoga. Dhrupad retained the essential nature of the Prabandha tradition of deep introspection in elaboration of the Raga and in expanding the rhythmic patterns. Accordingly, the Dhrupad has continued to maintain the distinctions of Anibaddha (un-structured) and Nibaddha (structured) Gana through its Aalap and Bandish sections. In the Prabandha, Tena or Tenaka , one of its Six Angas, described as vocal syllables, meaningless and musical in sound with many repetitions of the syllables or sounds like tenna-tena-tom, conveying a sense of auspiciousness(mangala-artha-prakashaka), was sung after rendering Ragalapti; but, before the main section of the Prabandha i.e. the Dhruva which was set in meaningful words (pada) and meter (Chhandas) with appropriate Taala cycles. A similar practice was adopted in Dhrupad. The Tena of Prabandha became the Nom tom of Dhrupad. It was elaborated after rendering the Alap but before taking up the Bandish. The latter part of Alap slides into the more rhythmic nom-tom section, where the Raga develops with a steady pulse employing meaningless syllables such as nom tom dir tana etc, but without the binding of the Taala. The counterpart of Nom tom in the instrumental music is the Jor –Jhala of Sitar. Now, the term Bandish meaning the structure of the song is the re-formed name for Bandha of the Prabandha Music. And, similarly, Vastu of Sangita-ratnakara took on the Persian name Chiz to denote either a text, or a text and its melodic setting. The latter part of Bandish is the series of Improvisations executed mainly through playing on the words of the text by breaking it up, but keeping the group of words , so formed distinct. This division of words synchronized with the beats and cross rhythms is called Bol- Bant. In addition, melodic ornamentations, such as meend and Gamaka are also employed for improvisation. And , with Pakhawaj , Laya –bamt , an improvised and playful rhythmic patterns are woven in an enterprising manner. 18.4. In a similar manner , in the Karnataka Sangita , the Udgraha and Dhruva of the Prabandhas took on the name of Pallavi , while Melapaka , the bridge, came to be known as Anu-pallavi (that which follows the Pallavi). The length of Dhatus (sections of the song) was extended by introducing the Antara as the second theme into Anu-pallavi. At the same time, the large number of sections (stanzas) was reduced. And, Abhoga the concluding section of the Prabandha became the last charana (stanza) of the Kirtana or Kriti accommodating the Mudra (signature) of the composer. Tena that were originally used in the Tena-karana of the Prabandha lost their mystique nature and became meaningless musical syllables- Taana-s. In the Ragam-Tanam-Pallavi , particularly in Veena , the Tanam , was derived from the Tena-karana which was meant to be played on the Veena in the Nanda type of songs of the Viprakirna class of Prabandha. The Taanam (played soon after the latter part of the Alapana) is a particularly endearing segment of the Veena play of the Karnataka Sangita. Svaras which had been prominent in the ancient Vartani and Svara –karana songs of the Shuddha Suda and in Ali Krama song Svarartha re-appeared as Chitte Svara in Karnataka Kritis; and asSapta tan in Khyal of Hindustani Music. The Neraval of Karnataka Sangita is similar to Bol- Bant of Dhrupad. The application of the Drum syllables (Pata) once the a characteristic feature of the Paata and Bandha–karana of the ancient Shuddha Suda and of the vernacular Sukanku song of the Viprakirna led to the creation of new forms such as Hindustani Tarana and the Karnataka Tillana. The simple devotional form Viprakirna type of Prabandha served as the model for various types of Padas, songs etc. In addition to the regular words (Pada) , the tone-syllables (Svara) , drum-syllables(Pata) , epithets (Birudu) , invocatory syllables (Tena) and musical meter (Taala) were used again for composing many song-forms in regional languages . The Suladi and Ugabhoga songs of the Haridasa-s were derived from Salaga Suda Prabandha. And, Suladi Taala-s were also derived from the Prabandha practices. The epithets Birudu which once had been the important element in the Birudu Karana of the Shuddha Suda and which mainly constituted the famous lauds (Namavali stotra) of Sanskrit literature (in the musical treatise called Stavana manjari) became the basic element of the Namavali and Divya nama Kirtanas of the Karnataka sangita. As regards the Taala of the ancient Shuddha Suda, they found their way to the Karnataka Kirtana and Hindustani Dhrupad through the mixed forms of Salaga Suda, perhaps during the second half of the 12th century. Thus, almost all musical forms in the realm of Karnataka sangita owe their origin to one or other types of Prabandhas. Many elements of the Prabandha found their re-birth in various musical forms such as Kriti, Kirtana, Varnam, Padam, Daru, Javali, Tillana etc. 19.1. By about the end of 17th century a realisation dawned on the musicologists and composers that Prabandha format had grown very rigid, laying more emphasis on the text than on the musical content; and, that the faithfulness to the form was, at times, carried to its limits. 19.2. And, Prabandha, naturally, had to give place to improvised, easier and innovative (manodharma samgita) forms of music having distinctive features of their own. Yet; here too, it is the basic elements of Prabandha that provided guidelines to modern composers of classical music. 19.3. Most of the medieval Prabandha-s eventually disappeared because of the stiffness of their musical construction. Yet; it should also be mentioned that Prabandha helped the Karnataka Sangita, enormously, in defining its concepts and terms, specifying the structures of its songs , refining its Grammar and in ensuring continuity of our ancient tradition. In the next segment lets talk about the Desi Sangita and the Ragas. Very informative article.. Could you help me get more details on Kaivada Prabandham if you can? I came to know that Kaivada Prabandha was a ritual rendition by the Talinangas in ancient Kerala. As said, Ali was an insertion of a series of systematically arranged compositions into Shuddha Prabandha. It was therefore treated as intermediary between Shuddha-Suda (songs of pure cycle) and Salaga-Suda (songs of mixed cycle) Prabandhas. Such practice must have, initially, served a ritual as well as an artistic purpose. Manasollasa provides instances of the arranged Ali Prabandhas. It was believed such singing was equivalent to reciting the Mantras. The 24 Prabandhas of Ali class, were mentioned as : — Varna; Varnasvara; Gadya; Kaivada; AhkacarinI; Danda; Turagalila; Gajalila; Dvipadl, Cakravala; Krouncapada; Svar-artha; DvanikuttanI; Arya, Gatha, Dvipathaka; Kalaharhsa; Totaka; Ghata; Vrtt; Matrka; Ragakadamba; Pancatalesvara; and Talarnava. And when the Ali Prabandhas were combined with Suda they were said to be thirty-two. The Prabandhas as Citrakarana, Misrakarana, Varnasvara, Kaivada, Ghata, Pancabhangi, where the combination of all major elements (angas) of Prabandha finds place, could be compared with present day Varnam. Ali-karana was a Tri-Dhatuka Aniryukta Prabandha; meaning that it was an Aniryukta (unstructured) Prabandha consisting of three Dhatus (or elements). Kaivada, falling under Ali-karana, had accordingly three Dhatus: Pata, Birudu and Tala. Its Pata was composed of syllables of drum-instruments (Patakshara of vadya) or (instrumental syllabic sound); Svarartha (composed mainly of sol-fa- syllables and, Margatala was its Tala. The subject matter of its Sahitya was to sing the praise of the Lord. And, such text (Birudu) composed by auspicious (mangala-kara) syllabic sounds resembled that of a drum was called Kaivada. It is said; the dance performances concluded with the auspicious Kaivada Prabandha. The sounds of the cymbals are generated by their mutual contact, so also Mrdanga was played with hands. . And, during the Kaivada performance, the Tala or drum-syllables (pata) were maintained, by keeping–time with hands. It is said, the term Kaivada was originally known as Hastha –pata or Hasta-vadana which means percussive syllables generated by clap of hands. According to Kallinatha, the term later came to be called as Kara-pata .And. Then its colloquial form became Kaivada (Hastha = Kai, in Kannada). The Kaivada Prabandha composed of Drum-syllbles (pata) , sol-fa syllables (Svarakshara) (where Pata or Svara- anga or Solkattus are more prominent) and Tala is said to be the forerunner of the Jakkini, which was in vogue during the times of the Nayak kings of Tanjavur, and later on the Tillana and Jatiswaram , with which the Dance recitals concludes. Jakkini Daru has an interesting format. It commenced with Jaati-Svaras (series of notes, sol-fa); and, the words (lyrics) were in the second section of the song. Jakkini was a popular form of Daru during the time of Nayaks. And, in due time, Jakkini Daru gave raise to Tillanas. Therefore, Tillana or Tillana type of dance performance (either as Kaivada or Jakkini) has a long history of nearly about 1500 years. You mentioned Talinangas of ancient Kerala. It is said; many of the temples of Kerala in the past had danseuses attached to them. The main duties of the Devadasi-s included singing and dancing in front of the deity; holding Tookkuvilakku during temple processions. They were considered as auspicious women (Sumangali). The system of temple danseuses of Kerala seems to go back to at least about 10th Century. During those times, the Devadasis-s in Kerala were known by the general name of Tevidichi (woman who serves at the feet of god). Their dances were called Tevidichiyattam or Tevidichi Koothu. Devadasis-s were also known by various names , such as Nanga, Talinanga, Nangachi, Nangayar, Nangaiyar, Talivadhu, Koothathi, Koothacchi and Tevidichi. Devadasi –s who were considered auspicious perhaps were performing Kaivada Dance, in praise of the deity.